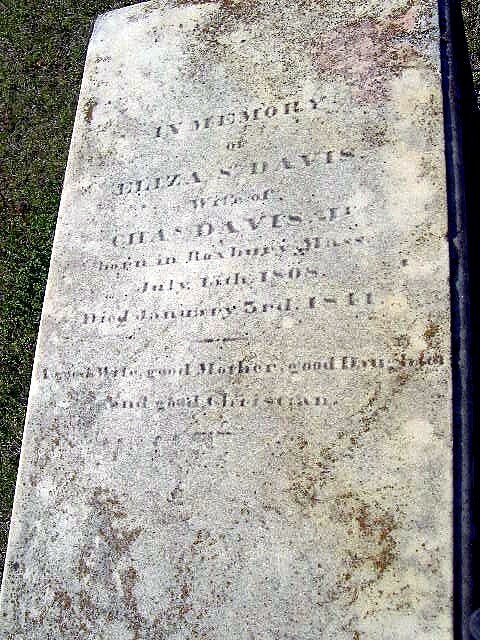 Eliza S. Davis was born in Roxbury, Massachusetts 15 July 1808 and died in Macon, Georgia 3 January 1841. Just 32 years young. What is to blame for her untimely death? 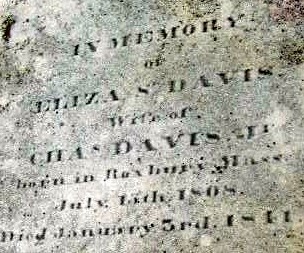 According to an obituary in the 5 January 1841 Macon Georgia Telegraph, "consumption" was the cause. In short, consumption used to be a common term for tuberculosis. This was because it seemed to consume people from within, with a long relentless symptom of "wasting away." According to the World Health Organization, when the disease becomes active, 75% of the cases are pulmonary TB, that is, TB in the lungs. Symptoms include chest pain, coughing up blood, and a productive, prolonged cough for more than three weeks. Systemic symptoms include fever, chills, night sweats, appetite loss, weight loss, pallor, and fatigue. 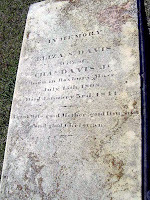 Mrs. Eliza S. Davis was laid to rest in the Old City Cemetery of Macon, Georgia. 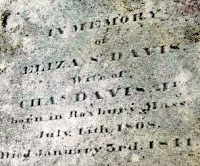 Her epitaph describes her as A good Wife, good Mother, good Daughter and good Christian. This photo, from which the opening photo was cropped, was taken by James Allen and submitted to the USGenWeb Archives.